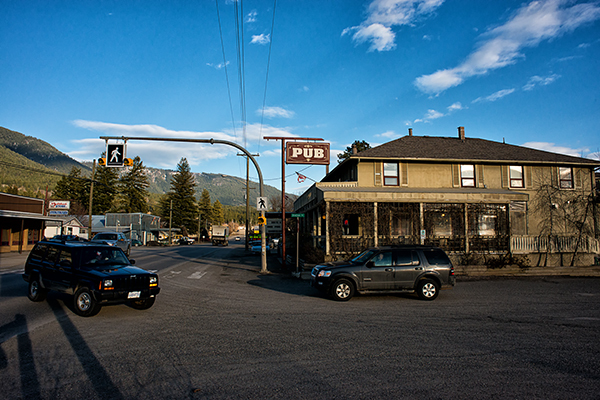 Falkland is one of the many small towns nestled along winding highway 97 that drivers almost miss if there weren’t signs posted at both ends of the village requiring them to slow down. Although I pass through there regularly, the only time I stop is when locals hold their roadside market during the summer. Usually I just reduce my speed to 50 km, watch for pedestrians and approaching vehicles from covered side streets, then resume speed without even thinking. 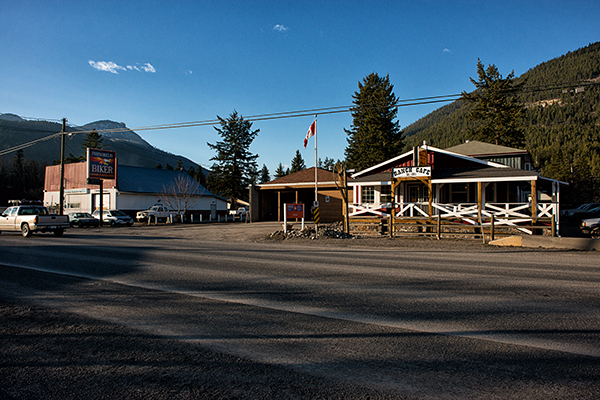 Falkland has about 600 residents, and is notable because each year on Victoria Day they host the Falkland Stampede (one of Canada’s oldest rodeos); and they also claim to have the biggest Canadian flag in western Canada. My wife recently purchased a 24mm wide-angle lens and we were looking forward to checking it out. We had spent the day in Kelowna, about an hour south of Falkland and I thought that with the drive there would be lots of opportunity to see how her new lens would perform. I had read mixed reviews online, and I was anxious for my own results. I had made a few shots of the fence in front of our home, and allowed some side-lighted images to catch sunlight to check lens flare, but I hadn’t made any practical images. I know reviewers can be very strict with their lens testing and even go so far to include charts and exaggerated enlargements when they evaluate a lens. However, in my opinion, all that most users care about is if a new lens is reasonably sharp and consistent in how it reproduces a subject; and regarding wide angles, if there is any unflattering distortion. The day had been long and I wasn’t thinking about much of anything except getting home and out of that car before we lost daylight. I don’t mind winter very much, but I do mind driving that narrow, slippery, winding road after dark. However, traffic had been light and we hadn’t got stuck behind any big trucks. So we were making good time when we approached Falkland. Photographers talk about that “Golden Hour” just before sunset when the light is warmer and softer than when the sun is higher in the sky. 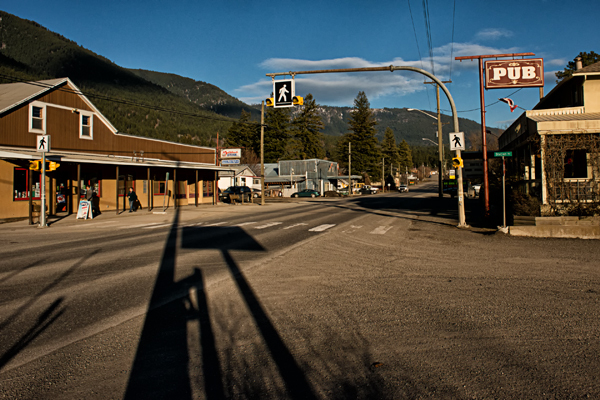 I doubt there is much of a golden “hour” in canyon towns like Falkland, but the light certainly was inviting at the moment and we had my wife’s camera and 24mm lens waiting for testing. Linda was tired from our long day and was only willing to make a couple of shots of an old shop before handing me her camera. She said, “You walk around”. So I did. In Falkland it doesn’t take much time to see everything on the main street. I like buildings, shop signs and afternoon deep shadows and the narrow street was perfect for testing that lens and anyway, I was happy to finally make a few pictures while the light was exciting in that interesting little town. I only walked around for about ten minutes and had so much fun that I forgot I was supposed to be testing that lens. 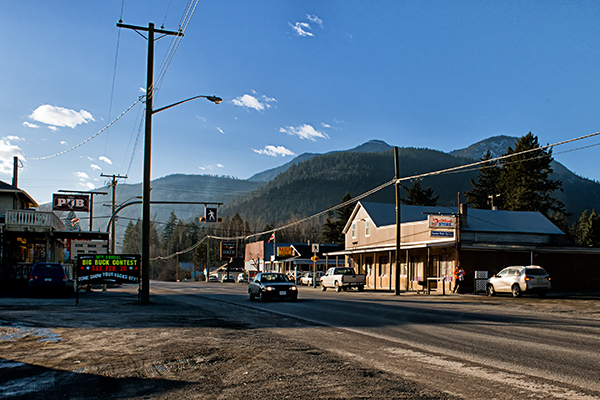 I have lived in this part of British Columbia for over 30 years, and as I walked around I wondered why the only pictures I have ever seen of Falkland were a few of cowboys being bucked off at the rodeo. I guess it is hard to stop and look. And some photographers might feel locals would be uncomfortable with outsiders intruding. I doubt that unless someone stuck a lens in a local’s face they wouldn’t even notice a person standing along the street, like I was, taking a few pictures in that neat little town. Oh, and that Nikon 24mm was just fine. For those that wanted a review, I think my aperture was mostly at f8, f11 and f16 because I was interested in getting as much depth of field as I could get. So I can’t comment on how well it performs wide open. This entry was posted in Photography and tagged aperture, british columbia, camera, depth of field, Falkland, Golden Hour, Highway 97, John Enman, lens, Nikon 24mm, photographers, photography. Bookmark the permalink. nice light at that time of day, the shadows are cool in that last shot. Thanks Fragg….I really struggled to hide behind the power pole so my shadow wasn’t in the picture.